Note: I have not read this book yet. This is a book review by Tom Chantry. This book is definitely on my wish list. 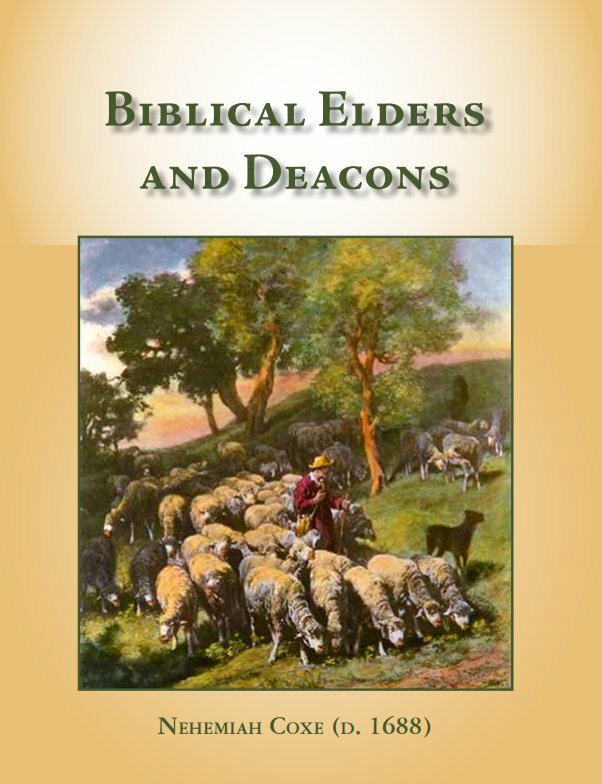 My interest in this topic of course reflects the conversation which has taken place among Reformed Baptists, particularly within ARBCA, about the nature of God. However, it is a matter of great importance to all Christians. If we think of God wrongly (which almost always means imagining him as being one of us! ), then we will neither serve nor worship him as we ought. In the course of two years’ discussion, I have heard it said with increasing frequency that the doctrine of impassibility is simply too complex to be stated, affirmed, believed, and taught in the churches. In part this is because the very word “impassibility” is alien; in part it is because the subject itself has been forgotten over the years. The recovery of the doctrine has required careful investigation of old theological and philosophical language, as well as a careful examination of our biblical exegesis at many points. So much for the supposed incomprehensibility of this subject. Now we have a new book to point to which could have been written precisely to address the question of whether or not the doctrine of divine impassibility can be simply taught. It is the second product of Pastor Samuel Renihan’s pen on the question before us. Earlier this year I reviewed God Without Passions: a Reader, which is a summary of the teaching of Reformed and Particular Baptist thought on the question of impassibility during the 16th and 17th centuries. That book was provided as a backdrop to the confessional statement that God is “without body, parts, or passions,” and was intended for pastors and theologians to see how the understanding of impassibility was interlinked with a broader understanding of the nature and character of God. 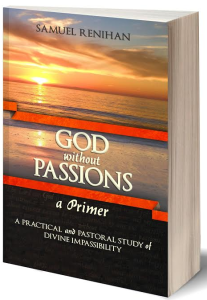 God Without Passions: a Primer, on the other hand, is written with a broader audience in view. The intent is to give a basic introduction to a subject which, while intrinsically complicated, is nonetheless very explainable. Every person who has any respect for the Bible will admit that there is a doctrine or teaching about ELECTION. Concerning this doctrine Christendom has split into two camps. Those denominations which believe salvation to be wholly of divine grace apart from any human merit at any and every point, have made deliberate statements in their confessions of faith, while those who have a place for human merit have left the matter out of their confessions. For example, when Mr. Wesley broke with the Church of England, he made certain changes in The Thirty Nine Articles, eliminating entirely the Seventeenth which relates to Predestination and Election. However, Mr. Wesley did express himself on the question. In one place he speaks thus: “The Scriptures tell us plainly what predestination is: it is God’s foreappointing obedient believers to salvation, not without, but according to His foreknowledge, of all their works from the foundation of the world.” God, from the foundation of the world foreknew all men’s believing or not believing. And according to this, His foreknowledge, He chose or elected all obedient believers, as such to salvation. Mr. Wesley has made the issue clear: those who believe election is conditioned upon something good foreseen in the sinner as the ground of the Divine choice are rightly called Arminians, while those who deny anything good in the sinner as the ground of the choice are rightly called Calvinists. In another place Wesley says that Arminians believe election is conditional. What does the Bible say? Paul speaks thus in #Ro 11:5,6: “Even so then at this present time also there is a remnant according to the election of grace. And if by grace, then is it no more of works: otherwise grace is no more grace. But if it be of works, then is it no more of grace: otherwise work is no more work.” Paul is alluding to conditions in Israel in the days of Elijah, who felt that he was the only true worshipper of God left in the land. God corrected the prophet by saying, “I have reserved to myself seven thousand who have not bowed the knee to the image of Baal.” The obvious meaning is that God had graciously intervened to prevent the seven thousand from following the multitude into idolatry. “Even so,” says Paul, referring to the believing remnant of his day, who were naturally no better than the unbelieving mass, but who had been graciously chosen to salvation. To the same effect, the Apostle says to the Corinthians: “For who maketh thee to differ from another? and what has thou that thou didst not receive? now if thou didst receive it, why dost thou glory, as if thou hadst not received it?” (#1Co 4:7). In praying for the lost just what are we asking God to do? What did Paul ask God to do for Israel? Did he not ask Him to spiritually enlighten them so that they would cease trying to save themselves and trust Christ for the righteousness they were trying to establish for themselves? “Brethren, my heart’s desire and prayer to God for Israel is, that they might be saved. For I bear them record that they have a zeal of God, but not according to knowledge. For they being ignorant of God’s righteousness, and going about to establish their own righteousness, have not submitted themselves unto the righteousness of God. For Christ is the end of the law for righteousness to every one that believeth” (#Ro 10:1-4). It appears shocking to believe that any aspect of salvation is conditioned upon anything the sinner can do apart from the inwrought grace of God. 1. Election is God’s choice. It is God’s choice in eternity of those He will save in time. There must be selection or universalism. The word election is associated with God, not with man. “And except that the Lord had shortened those days, no flesh should be saved: but for the elect’s sake, whom he hath chosen, he hath shortened the days” (#Mr 13:20), speaks of the elect, whom He elected, rendered in the King James version: “The elect whom he hath chosen.” The theology that God votes for us, the devil votes against us, and that we cast the deciding ballot is entirely outside the pale of Scripture teaching, and is almost too ridiculous to notice. Our Lord said to His disciples, “Ye have not chosen me, but I have chosen you.” “According as he hath chosen us in him before the foundation of the world, that we should be holy and without blame before him in love:” (#Eph 1:4); “But we are bound to give thanks alway to God for you, brethren beloved of the Lord, because God hath from the beginning chosen you to salvation through sanctification of the Spirit and belief of the truth” (#2Th 2:13). Self election is a bad form of self-righteousness. 2. Election is God’s choice of some persons. Universal election is a contradiction of terms. This is too obvious to need argument. In “What then? Israel hath not obtained that which he seeketh for; but the election hath obtained it, and the rest were blinded” (#Ro 11:7) Paul says that the election (elect) hath obtained salvation, and the rest were blinded. 4. Election is God’s gracious choice. This means that there was nothing in the creature as the cause or ground of the choice, “but of His mere mercy in Christ.” Unconditional election finds illustration in the case of Jacob and Esau, “For the children being not yet born, neither having done any good or evil, that the purpose of God according to election might stand, not of works, but of him that calleth” (#Ro 9:11). This naturally gives rise to the human objection: “Is there unrighteousness with God?” Paul replies in the negative and then asserts God’s sovereignty: “Therefore hath he mercy on whom he will have mercy, and whom he will he hardeneth” (#Ro 9:18). God’s own sovereign pleasure alone determines or selects the object of His mercy. 5. Election is unto salvation. It is not denied that there has been a Divine Choice of nations to external privileges and blessings, nor that individuals have been chosen to particular service; but we affirm that the Scriptures also teach an election of individuals to everlasting life. “But we are bound to give thanks alway to God for you, brethren beloved of the Lord, because God hath from the beginning chosen you to salvation through sanctification of the Spirit and belief of the truth:” (#2Th 2:13). Election is not salvation, but unto salvation, which means it was before and not after salvation. Men are saved when they trust Christ not when they were elected. Eisenhower was not president when he was elected, but when he was inaugurated. There was not only an election to but also an induction into the office. And so God’s elect are inducted into the position of saintship by the effectual call the quickening work of the (Holy Spirit) through which they become believers in the gospel. “That no flesh should glory in his presence” (#1Co 1:29). Many are the objections brought against the doctrine of unconditional election. Sometimes the objectors are loud and furious. The tirades of Mr. Wesley against the doctrine make one sick at heart. And many Baptists have been almost as harsh. 1. It is objected that election limits God’s mercy. Right here we criticize the critic, for he who makes this objection limits both God’s mercy and His power. He admits that God’s mercy is limited to the believer and that all others will experience the wrath of Divine justice. But our critic denies God’s power in causing the sinner to believe without doing violence to the human will. In conversion God does not slay the human will, but only the enmity of it. At this point we must face two selfevident propositions. First, if God is trying to save every member of Adam’s fallen race, and does not succeed, then His power is limited and He is not the Lord God Almighty. Second, if He is not trying to save every member of the fallen race, then His mercy is limited. We must of necessity limit His mercy or His power, or go over “boots and baggage,” to the Universalists’ position. But before doing that, let us “to the law and to the testimony,” which says, “I will have mercy on whom I will have mercy, and I will have compassion on whom I will have compassion …. Therefore hath he mercy on whom he will have mercy and whom he will he hardeneth” (#Ro 9:15-18). There is not space here for exegesis except to say that in hardening the sinner, God does not infuse a sinful nature, but allows the sinful nature to develop its natural enmity. The writer has always preferred the word preterition to reprobation in describing God’s dealing with the non-elect. In hardening God leaves the sinner to himself, so far as efficacious grace is concerned; in mercy He makes new creatures in Christ Jesus. When Robert Morrison was about to go to China, he was asked by an incredulous neighbour if he thought he could makes any impression on those Chinese. His curt reply was: “No, but I think God can.” The writer often wonders why more sinners have not been saved in the past centuries, but he never attributes it to lack of power in God. If God could make children unto Abraham out of stones, then He is able to make children unto Himself out of all kinds of sinners. 2. It is objected that election damns a part of the human race. But the objector is wrong. It is divine justice that condemns the whole race, and election keeps many from being damned. Election is for “the already condemned.” Election neither puts sinners under condemnation nor keeps them there. Election is not unto damnation, but unto salvation. Election harms nobody, but saves a multitude no man can number. If we are to object to a doctrine that saves only a part of the human race, then we object to the gospel, for that is all the gospel does. 3. It is objected that election makes God unjust. This objection betrays a bad heart. It obligates the Lawgiver to save the Lawbreaker. It makes salvation a Divine obligation. It reverses the position of God and the sinner. It puts the sinner on the throne and God at his feet. Salvation is not a matter of justice, but of mercy. It was not the attribute of justice that led God to provide salvation, but the attribute of mercy. Justice is simply getting what one deserves. Those who go to hell will have nobody to blame but themselves, while those who go to heaven will have nobody to praise but God. But the objector is wrong again. Our view of election explains and supports the doctrine of “Whosoever Will.” Without election the invitation would go unheeded and nobody would believe. It is not natural for the sinner to trust Christ, and this is because the carnal mind is enmity against God. Salvation through trust in a crucified Christ is a stumbling block to the Jew and foolishness to the Greek; it is only the called, both Jews and Greeks, who see in it the wisdom and power of God in salvation. Christ said, “No man can come to me except the Father which hath sent me draw him; and I will raise him (the one drawn, C.D.C.) up at the last day” (#Joh 6:44). The human will is free, but its freedom is within the limits of fallen human nature. “But the natural man receiveth not the things of the Spirit of God: for they are foolishness unto him: neither can he know them, because they are spiritually discerned” (#1Co 2:14). There must be the miracle of the new birth, for except a man be born from above he cannot see or enter into the kingdom of God. The writer allows nobody to believe stronger in the doctrine of “Whosoever Will,” nor to preach it with more sincerity than he does. But he also believes that there would be no believers if the Holy Spirit did not convict the sinner of his helplessness and convert him to faith in Christ. The saved man is God’s workmanship, the product of His grace. 5. It is still further objected that unconditional election destroys the spirit of missions. This objection deserves serious consideration. It is admitted that some have allowed belief in the doctrine to paralyze missionary endeavour. But this was because they held a limited view of the doctrine; they failed to see that the gospel is the means by which the elect are saved. On the other hand, the greatest names in the missionary enterprise were ardent believers in unconditional election. William Carey, often called the father of modern missions, was a staunch Calvinist. Andrew Fuller, first secretary of the society that sent Carey to India, held tenaciously to the doctrine of unconditional election. “The proof of the pudding is in the eating.” Belief in election did not destroy the spirit of missions in Judson, Spurgeon, Boyce, Eaton, Carroll, Graves, Shields, and a host of other Baptist leaders. The First Baptist Church of Murray, Kentucky, once called by Dr. J.F. Love the greatest missionary church on earth, heard Boyce Taylor preach election for nearly forty years. He who allows his belief of election to dampen his missionary ardour has a perverted view of the doctrine. Election does not determine the extent of missions, but the results of it. The gospel commission does not read, “to the elect” but “to every creature.” If it should read “to the elect,” then we could not preach to anybody for the simple reason that the elect cannot be identified until they exercise faith which works by love. And such would already be saved, and hence the gospel would not be the power of God unto salvation. The gospel is for men as lost sinners, and not as elect sinners. God has His elect, but they are not our elect, and His elect cannot be known until they are saved. Witnessing is our business, taking care of the elect is His business. Let us be faithful to our task and leave the results with Him, remembering that Paul may plant and Apollos may water, but that God must give the increase. Augustine wrote City of God as an apologetic in response to those who were crediting Christians with the downfall of Rome. They argued that Christianity as a religion weakens cultures and makes them susceptible to overthrow by foreign powers. Augustine argued to the contrary that, whereas faithful commitment to the God of Scripture has always brought about flourishing in particular cultures, increased rebellion against Him has always resulted in their downfall. Within these cultures, Augustine recognized that there were two types of citizens: those of the City of God and those of the City of Man (also known as the city of this world or the earthly city). Augustine distinguished the City of God from the City of Man. These two cities are organized societies with citizens who are respectively distinguished by the standards by which they live. Citizens of the City of Man live by the standard of the flesh, whereas citizens of the City of God live by the Spirit (cf. Galatians 5:13-26). Augustine emphasizes that what ultimately distinguishes the two cities are their loves: “We see then that the two cities were created by two kinds of love: the earthly city was created by self-love reaching the point of contempt for God, the Heavenly City by the love of God carried as far as contempt of self.” (Book 14, Chapter 28). I enclose this in Uncle’s note. Is he better? I have much enjoyed my three days in London, and am no happy at home. I am very thankful that, if spared, I am going back to Cambridge. Of my progress there I am not ashamed; it should and might have been greater, but still it is somewhat. My faults I have not learned there, I had the same at Maidstone, and I am not at all fond of having blame thrown on the place where Providence has placed me. I am all fault, but what God’s grace has made right. I am content to be evil spoken of, if I can but grow in grace and serve God. Where I have most opportunity of telling sinners the way of salvation, and of preparation for a future course of labor, I trust I shall always feel most happy. Human wisdom I desire to gain, but only in subservience, and as handmaid to spiritual knowledge and Divine instruction. Grandfather is with us now; he preached last. night on “Cast thy burden upon the Lord, and He shall sustain thee: He shall never suffer the righteous to be moved.” A blessed thing it must be for the new born sons of God to have such a stay in the hour of trouble; and he who having left his own righteousness, trusts alone on Jesus, has a perfect right to this promise. Mother is gone to old Mr. Merchant’s 52st Anniversary at Layer Breton. He is almost past preaching, and stands a monument of the unchanging love of God, who, having once loved a person, will always love him. The motto over his pulpit is, “We preach Christ, and Him crucified.” I am sure you need all the comforts of the gospel now, and I wish I knew enough to be able to give them faithfully and successfully; that is reserved for future lessons of experience. None who rely on Jesus Christ will ever find their troubles too heavy; for all those who take Him as their whole Savior, He is a supporter. May God deal kindly with you, and support you! Love to self and Uncle from all.